Mufflers are employed to reduce sound emissions of motors. 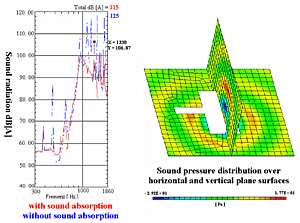 They, however, also portray acoustical transmission elements, that can unfavorably influence the sound emission through cavity properties and partial oscillations of the surfaces. This can be noticed by a muzzle noise and by the sound emission via body noise. 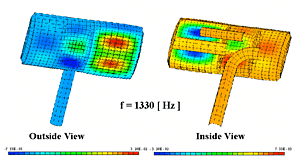 A muffler of a pickup was investigated to determine how the total acoustic power is distributed between body and muzzle noise and what can influence the acoustic radiation. It was of particular interest to determine how sound can be reduced with the use of basaltic wool. The top figure shows a surface mode shape at 1330 [Hz]. If the fumes are excited by the motor, sound is also radiated by this mode shape (center figure). The distribution of sound radiation in body noise and muzzle noise is visible for this resonance frequency in the bottom figure. Whereas a large amount of acoustic power is radiated over the surface at above 1 [kHz], the acoustic power below 1 [kHz] is almost only radiated over the muzzle. 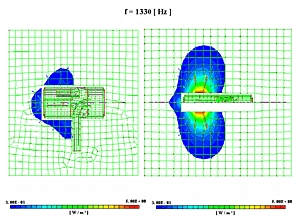 This aspect must be taken into consideration when defining measures to reduce sound radiation. The lower frequency range can be influenced by the geometric design of the muffler cavities, whereas the higher frequency range can be improved by stiffening the surface with beads or ribs. By covering the inner front surface with basaltic wool, the sound radiation can be reduced by 10 [dB]. This measure, however, does not work for resonance frequencies where the shell has high participation on the corresponding mode shapes.